A United Express regional jet sits between the runway and a taxiway at Presque Isle International Airport on Monday, March 4, 2019. Investigators with the National Transportation Safety Board say in an aviation accident preliminary report that the plane missed the runway on approach. Of the 31 people on board, two passengers and one crew members suffered minor injuries. PRESQUE ISLE, Maine — The United Express passenger plane that ended up off the runway at Presque Isle International Airport on March 4 missed the runway on its approach and landed to the right of it, according to a preliminary report by investigators with the National Safety Transportation Board. 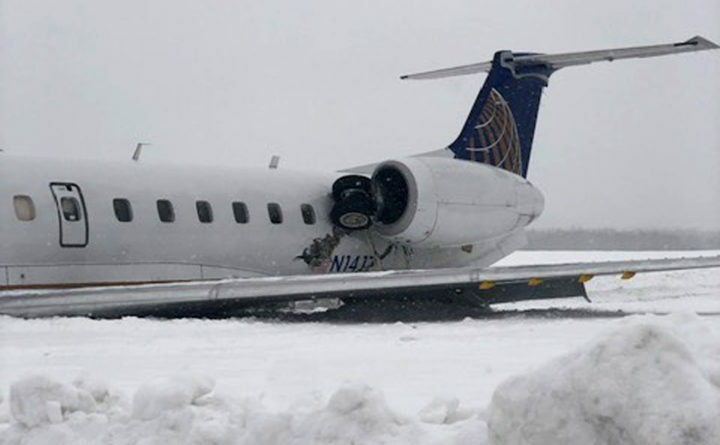 The city initially reported that the 50-seat Embraer 145 jet flying in from Newark, New Jersey, with 31 people on board, had landed on the runway and then skidded off into the snowy field. The radar tracking system shows that the plane was aligned right of the runway during both its first approach, when the pilot decided not to land, and the second approach when it did touch down, according to investigators. Of the 28 passengers and three crew members on board, two passengers and one crew member suffered minor injuries. The accident also “substantially damaged” the plane. Investigators do not say what caused the plane to miss the runway, and provided no other information in the very brief preliminary report. A photo of the plane taken by one of the passengers, Cassie Daigle of Fort Kent, shortly after the landing shows part of the landing gear embedded in one of the engines. He said the plane then bounced four or five times before coming to a stop at a location far from the runway. “The plane literally is nowhere near the actual runway,” he said, adding that snowplows had to remove snow so that emergency responders could get to the plane to help the injured passengers. The scene inside the airplane as it landed was one of chaos with people screaming and seats coming apart, Rick Daigle said. All passenger flights out of the Presque Isle airport were suspended until March 13 while officials investigated the crash. Terry Williams, a spokesman for the NTSB, said earlier this month that a full report with an analysis and conclusion of what led to the accident would not be completed and issued for about a year. Since July 2018, United has operated Presque Isle’s only passenger air service with daily flights to and from Liberty International Airport in New Jersey. The United service replaced PenAir’s service to Boston under the federal Essential Air Services program that subsidizes air travel in rural communities.